Our team consists of highly experienced and skilled professionals from a variety of disciplines who are experts in the assessment and management of concussion. We provide personalized concussion care for adults, adolescents, and children who suffer a sports related injury from the first hours after a concussion throughout the entire recovery. 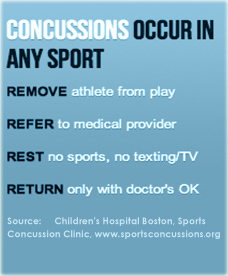 Knowing when it is safe to return to play is crucial in order to avoid serious brain injury. The Concussion Center of Fairfield County’s personalized concussion program was developed to address the comprehensive needs of an individual who has suffered a concussion, in order to facilitate his or her recovery and safe, confident return to play, school or work.